In small pot, bring salted water to a simmer and blanch garlic cloves for 2 minutes then set aside. In large pot, blanch green tomatillos for 3-5 minutes until tender; remove and bring to room temperature. Heat grill to medium-high heat and char the red onion until blackened and tender the whole way through. Combine garlic, tomatillos, red onion and remaining ingredients in a food processor and puree until smooth. Set aside. Rinse chicken inside and outside the cavity and place in a large pot; cover with cold water. Heat stove to high-heat and cook rapidly for five minutes, skimming the surface frequently. Lower to low-heat and add all ingredients except onion to the pot and simmer for 2 hours and 45 minutes. Heat grill or open stovetop to medium-high heat and place the onions over the flame until charred. Set aside. Strain the chicken mixture through a fine mesh sieve lined with cheesecloth, reserving the chicken. Cool the broth immediately. Once the cooked chicken is cool, pull the meat into ribbons and reserve in the refrigerator. In a large stock pot, bring the broth to a boil and add chicken and charred onion. Once hot, stir in the tomatillo puree. Cook for 5 minutes then remove from heat. 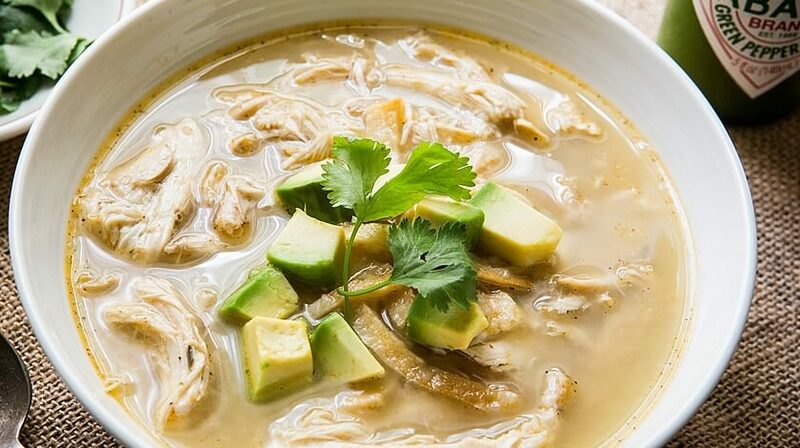 To serve, ladle 3 cups of soup into individual soup bowls and garnish with tortilla strips, avocado, cilantro leaves and a squeeze of fresh lime. Mild jalapeño flavor. Pairs well with dips and Mexican cuisine.